Isn't that a really nice conifer? Many of you have probably never seen one of these growing; it's likely that none of you have ever seen one in its native habitat because it only grows in a pretty remote area in the Blue Mountains and only a hundred or so trees grow there. Cultivation is making it relatively more common in many botanical and personal gardens in appropriate climates and habitats (it's really a tropical tree). Do you recognize it? 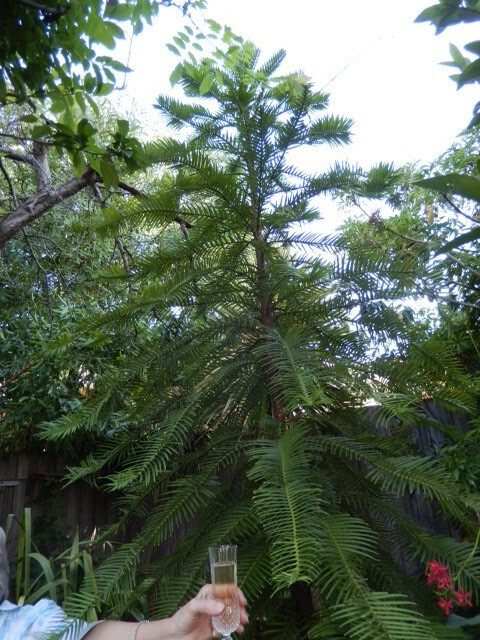 Wollemia nobilis, the Wollemi pine, is not a real pine but a relative of Araucaria. TPP is quite jealous of people who have one growing in their garden, and then you've got a friend rubbing it in, and toasting the occasion to boot. This species is a real living fossil known from its fossil record going back to the early Cretaceous before anyone knew it was still alive albeit barely so. TPP does have one growing in the university's glasshouse, but it's not the same as having one outside in the garden. Oh yes, the garden shown is in Australia. You can purchase seeds.